Hi Guys! I hope you are doing good! Exfoliation is a very important step of our skincare regime but is often neglected. It is a very crucial part of maintaining a healthy skin by removing old dead skin cells. Even though it depends on skin type and skin conditions, our skin always needs to be exfoliated at some regular intervals of time. Beauty in the Middle East, specifically India and Arabia has always been an inspiration for the people of the world to maintain their glowy, flawless and beautiful skin. Today we have a lot of exfoliation methods in cosmetology available: mechanical, chemical etc and in different forms but it has always been there. Women of the ancient times including Queens and Royalty had a lot of natural beauty secrets which prove to be beneficial for millions of beauty and skincare practices even today. There were many versatile ingredients which served amazing results for those skincare obsessed beautiful ladies; milk and honey being their topmost priority. Milk and honey has been one of the best combinations to achieve thousands of good results, some of them being non toxic bath, acne treatments, natural emollient, skin cleanser, moisturizer and hair softener etc. 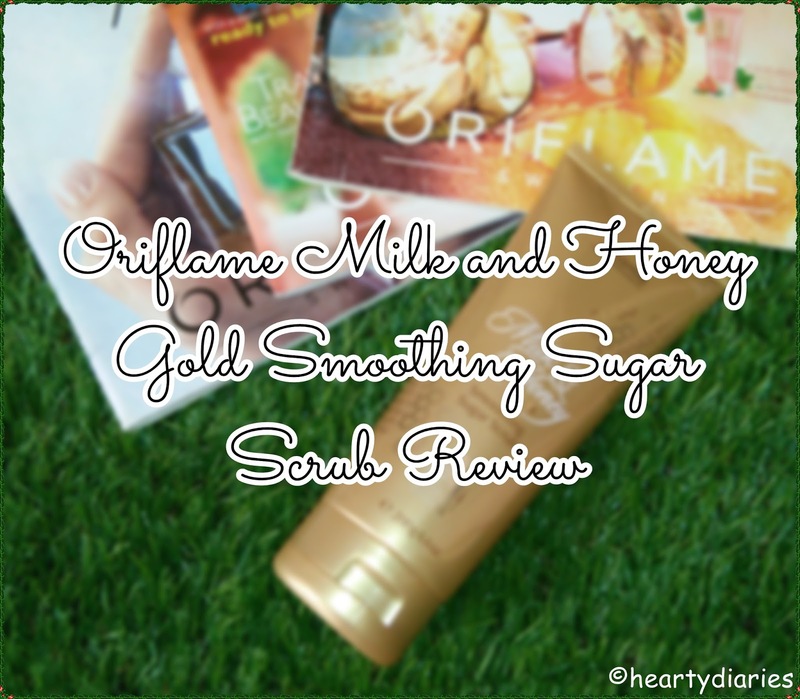 Recently I bought a lot of stuff from Oriflame because I love their skin care range and I couldn’t resist to pick up the “Milk and Honey Gold Smoothing Sugar Scrub” as soon as I saw it. I knew I had to grab it because to me, the surprising benefits of this duo are not unknown. Today I am really excited to share my review about this product with you all. 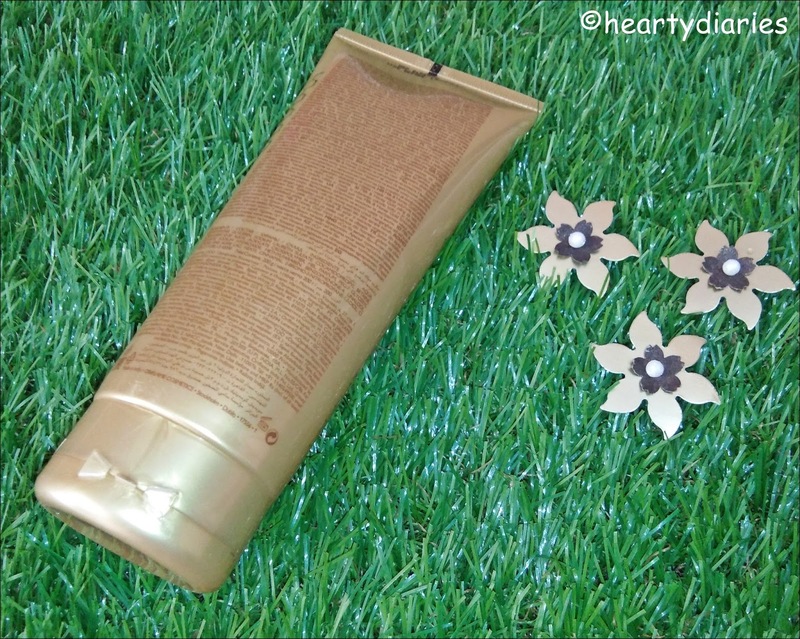 Product Description: Smooth away dead skin cells to reveal softer skin below with this rich, decadent body scrub. With organic milk proteins and honey extract to soften and condition the skin, it’s an experience to cherish. Directions of Usage: Apply on wet skin, gently rub in upward circular motion for 5 minutes. Rinse off with water and pat your face dry. Check Oriflame’s Official Website for more details..
Packaging: This scrub comes in a beautiful golden-coloured silicone-rubber kind of tube and has a flip cap which is tight enough to make the product leak proof but I wish it was transparent or little lighter in colour to see the amount of product left. The tube is really huge and heavy; not really great for travelling because of the space and weight factor but you can always transfer it in a smaller bottle/tube and you’re sorted. The tube looks really classy though. Texture and Consistency: I love how this scrub looks like. 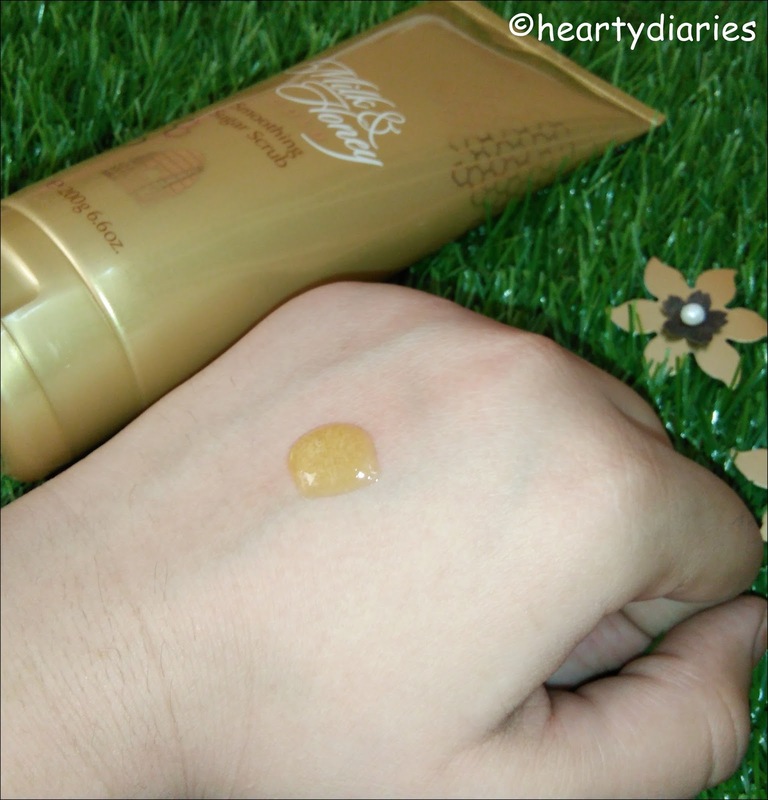 It has a golden gel kind of texture having a consistency neither too thick nor too thin. The scrub granules are very minute; lather up; have a golden-yellow colour and look really pretty. My Experience: Very impressed by the packaging of this product, I expected it to be really smooth, gentle and good on my skin too. The first impressions were really satisfactory as the texture, smell, consistency and all those factors were a yay-yay for me but the actual test was how is it going to perform. As I had to shave my arms, I thought of trying the scrub there because exfoliation should always be done prior to shaving to remove dead skin cells and prevent ingrown hair. I squeezed the tube gently to get an ample amount of product on my palm and started scrubbing my arms. I really liked the smooth gel kind of texture at first but as the scrubbing went ahead, I noticed that the scrub granules were not how they are supposed to be. To my disappointment, the granules are quite harsh on the skin even though I was rubbing it with no massive force in small, circular motions. Even though I didn’t like the abrasion factor present in it at all, once I was done with my application, I rinsed the scrub off and saw immediate and good results. My skin looked really clean, moisturised and supple. Next up, I went ahead and exfoliated my knees, legs and feet and found good results in terms of colour improvement and tanning as well but I wanted to try it out on my face too. I was really hesitant and unsure of scrubbing my face with this product because its not gentle enough to be used on face. I applied almost no pressure and worked in gentle, small and circular motions on my face. It felt abrasive again but it was bearable and I couldn’t wait to see the results. I rinsed it off with plain water and pat it dry with a soft towel. I expected a good result just like my hands and other body parts but to my surprise it was even much better. My face looked really soft and plump and my blackheads were completely removed within a few minutes of gentle (actually very gentle) scrubbing. Even though it leaves the skin smooth, it is not smooth as its name suggests. Even though I think I will never need to buy this scrub again because the product quantity is amazing but if I have to, I would love to buy it again. Yes. For the result it gives and huge quantity it has, this scrub is definitely worth the price. Final Verdict: Even though I am really happy with the overall result and would love to use it again, I don’t really like the abrasive scrubbing granules and wish they were gentle like other scrubs out there. I wish there was a smaller quantity option available as well because even though the quality and quantity is great and lasts really long but not everyone wills to spend Rs. 549 on a scrub without knowing if it would suit them or not. Overall, this is undoubtedly one of the best product of Oriflame in terms of ultimate results. My Advice: Even though you should never exfoliate too harshly, be extra gentle while using this one especially for face. Don’t rub hard. Wow!! Another great product. Thanks for sharing this!! Hope they listen to us! ??? Yes really!!! I love it tooooooo….